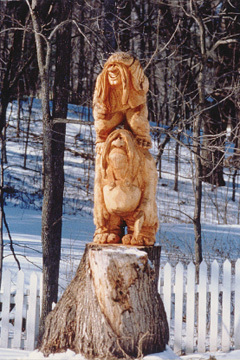 Mount Horeb woodcarver Mike Feeney has developed a real thing for trolls. 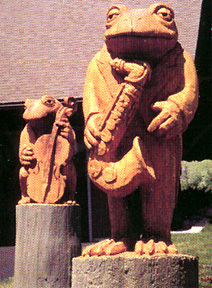 Not only does each troll have a name, but the details in his carvings are carefully selected to enhance either the troll's name or occupation, such as The Gardener and The Accordion Player. Shown in his workroom, Mike displays a clay model of The Tourist. Not all of Mike's models make it to a finished project. One such piece became dead art because a knot showed up where the eye would be, a flaw Mike considered too distracting. The Peddler appears to be walking the streets of Mount Horeb, shopping his wares to prospective customers. Why would an Irishman especially one with a name like Michael Feeney be carving trolls instead of leprechauns? While Mike's answer isn't exactly precise, it's easy to see that the Mount Horeb woodcarver has developed a real thing for trolls. Not only does each troll have a name, but the details (or props as Mike calls them) in his carvings are carefully selected to enhance either the troll's name or occupation. For instance The Peddler, near the front entrance of Open House Imports, is carrying not only a lantern and walking stick, but also a turkey leg. Don't miss the backside of this troll or you won't see the dead fish, pots and pans, keys a bedroll, and a knife all things a peddler would find useful. Humor is an intricate part of Mike's work. If it's not funny, there isn't any motivation, he says. That's why he likes to have people get up close to his trolls and look around. There's always a kick for those who do, he promises. 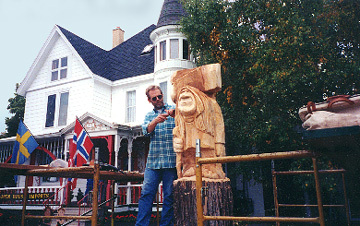 Before Mike began carving trolls, he worked with several other types of media and fantasy figures. I went through my humanoid fruit and vegetable thing, he explains, where he put faces on red peppers or sometimes lima beans. This was followed by what he calls his maritime mutant phase, when he made ceramic fish with faces. During this time he also fashioned exploding heads. Also during that time he sold his works at art fairs and, for five years, at the Minnesota Renaissance Weekends, held seven times a year at Shakopee. He says those experiences gave him opportunities together a lot of market research information. Art fairs are a hard way to make living, but a good way to meet the public and hear what they have to say. That's very important, he says. During that period Mike also made commissioned pieces on the side. Then, almost without his recognizing what was happening, his work switched over from having stock on hand to selling futures. He's happy about that, but he's almost embarrassed to admit his projects for the rest of this year are sold, and I have contracts for half of 1996. Mike admits his first reaction, when people approach him about buying one of his pieces, is to discourage them. I tell them the carvings are very expensive. Another factor is privacy, he says. 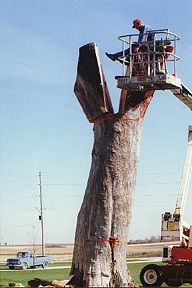 Depending on where the carvings are placed, owners have to be prepared for curiosity seekers. It takes a certain level of commitment to own one, especially if they're placed in public view. If he can accommodate these requests because they'll look good in his portfolio or if it fits in with the direction he's going he will agree. But the idea really has to 'fit', he emphasizes. After the first spark of an idea for a troll, Mike gets out his sketch book and begins drawing. It's not unusual for him to draw 100 sketches before one is just right. For major pieces, the next step is a clay model, complete with all the details that will appear on the finished product. Next, the task is to find the right log for a particular carving. He often finds his log supply at the same time he's fishing. Typically, what I'll do is go trout fishing, and out of one corner of my eye I'll be watching for a huge log with a lot of character. The logs have to be up to four feet across and at least 14 feet long. If he spies the right log, Mike approaches the owner, usually a local farmer, and offers him better than the going rate for the log. I also assure him I'll clean up my mess afterwards. I want to leave the farmer with a good feeling. It's important to treat people fairly. 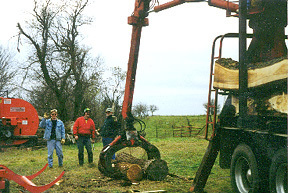 This method of harvesting the logs he needs is wonderful, Mike says. You don't have to wait for a tree to grow and you don't get any bad vibes from cutting into somebody's favorite. Besides, this way you can locate them anywhere the client wishes. His actual logging is done every other winter. Mike hires people to go in and get the logs he's purchased and deliver them to his studio. That's where the logs sit until he's ready to work on them. Since the carving is done on the buyer's site, Mike hires a backhoe operator to set the logs into five-foot holes and backfill with gravel. He always leaves a pedestal or base on the stump on which the carving will rest. Most figures take about a month to complete. Mike tries to do most of his work in the Mount Horeb area, so he can be home with his wife, Pam, an attorney, and their son, Erin, at night. But a couple of years ago he agreed to take on a project near Hubbard, Iowa, where he worked for more than two months seeing his family only on weekends. 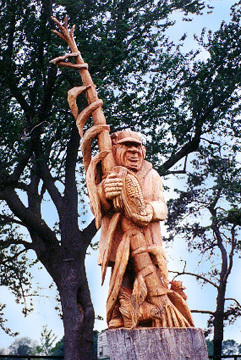 The 25-foot-high Iowa carving shows a farmer beside a cornstalk. He's checking an ear of corn in his hand, and viewers who get close enough can see three grinning corn borers looking down from the exposed kernels. This figure, carved from a maple tree on a century farm, has real meaning for the farm's owner, Bob Boeke. That's because his great-grandfather planted the tree shortly after coming over from Germany. It had been struck by lightning, and Boeke, a retired senior vice-president and director for John Deere, didn't want to see the tree end up in the fireplace. It took him two years to find someone willing to work on the project. Mike admits the project was a challenge. It's also the only time he's brought in somebody else to make the first cut with a huge chain saw. Nearing the bottom of the tree, he discovered a stock fence buried in the wood, the tree having grown around it. Not every carving gets completed. Mike isn't bashful about talking about dead art he's accumulated. While a couple of pieces can still be found in his workroom, I've learned it's therapeutic to burn dead artwork. It sort of frees you up. I've tried a lot of things risk-taking things, Mike says. But when I finish a piece, I need to get it out of my system. Some people spend a year on a piece of artwork, hauling it around from show to show, attempting to collect ribbons. Sometimes these pieces aren't even for sale. But that's not how I operate. When I finish a piece, I want it out of my sight. I've already sketched it, worked it up with clay, and photographed it a zillion times in the process. Working this way, I'm always excited about the next project down the line, he says. Besides getting ideas from other people, Mike takes one or two classes a year through Madison Area Technical College or UW-Extension. He's taken watercolors, portraiture and figure drawing. Even a calligraphy course will help you in your concentration and focus, he says. Classes offer another benefit. Not only does he get to look at other people's works, but you learn little tricks either from the class itself or from other students. One such trick involves checking his work in a mirror. That's one I'd never have picked up on my own. Now, when I'm about halfway done with a piece, I take a mirror and walk around it. This gives you a fresh eye and you're able to see it differently through the mirror. I guess it kind of fools our mind and gets into that left or right brain thing. We can all look right dead ahead at something and not see it, but by looking in a mirror it pops right out, Mike says. Mike estimates he completes about 10 major pieces a year, besides the usual research and development kinds of work. Prices range from $2,000 to $20,000, with most pieces falling somewhere between $10,000 and $20,000. Sometimes a donor or an organization is involved in a purchase. Other times it may be a business. At Little Norway, just west of Mount Horeb, Mike's carving of the Flying Wallendas can be found in the parking lot. 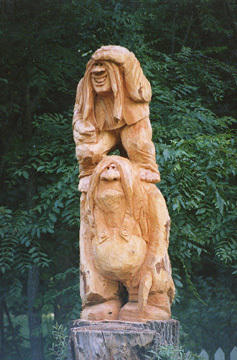 The three troll figures are popular with tourists. In fact, one of the trolls seems to be on the lookout for bus loads of tourists, Mike notes. Does he have any advice for would-be carvers? Don't be shy. Go ahead. If you goof, it can always be used for firewood. But always read the top of the tree before you begin, Mike suggests. Depending on the species of wood, there'll usually be a major check and two minor ones. A check, he explains, is a crack that will open up. You don't want to end up with a check down the middle of a face. It can go down the side of a face, but it is very distracting if it is in the center. Troll owners are given clear instruction about the care and feeding of their carving. Maintenance is pretty easy as long as instructions are followed, Mike ways. Actually, cows are good subjects for sketching, Mike believes, because they offer such a good study of anatomy. You can see where every bone is. It's kind of like they're upholstered with black-and-white skin. If you wanted to get interested in anatomy or wanted to draw people, cows are a great jumping-off point, he suggests. You don't need a lot of expensive equipment to carve wood, Mike says. I'm a low technology guy. I work with chain saws. He also uses smaller tools, grinders, and chisels. Besides trolls, Mike is just completing a set of frog figures for a composer. He thought he wanted trolls, but when I walked into his house, there were frogs everywhere. so what we ended up with were frogs playing musical instruments such as a tuba, a cello and a saxophone. Naturally, they're in formal attire, he adds. He's already working on a family of teeth for a dentist in Verona. Teeth are very interesting, he believes. Some kind dentists have saved a few of their most interesting and unusual extractions as models for the carver. Entering Mount Horeb from the west, the first troll visitors usually see is called The Gardener. It is in the tiny triangle where Springdale and Main Streets join. A close-up view will show the troll isn't using his sprinkling can to water the flowers. Regardless of the troll's misdeeds, the flowers thrive, largely because of the care they get from members of the Mound Vue Garden Club. Continuing along Mount Horeb's main thoroughfare, troll watchers can view, near Anchor Bank, Sweet Swill carrying her parasol and walking a pet pig. If you miss The Tourist troll in front of the Craft Haus, chances are the troll will already have snapped your picture with his own camera. The Chicken Thief, one of Mike's first trolls, is next to Olson's Christmas House, and the Accordion Player can be found near the Mount Horeb Telephone Company. The latter captured the interest of a bus load of Norwegian visitors who also happened to be accordion players. According to Mike, the bus pulled over to the curb and the passengers got out with their own accordions and serenaded the troll for at least 20 minutes much to the delight of onlookers. Because trolls tend to like visitors, they willingly pose for pictures. But Mike wants to be sure visitors don't plan to feed them, because they're already well fed on lefse and lutefisk.